Leaves have subtle white flecking. In winter, they can become incredibly colourful showing pinks, purples, yellows and greens. 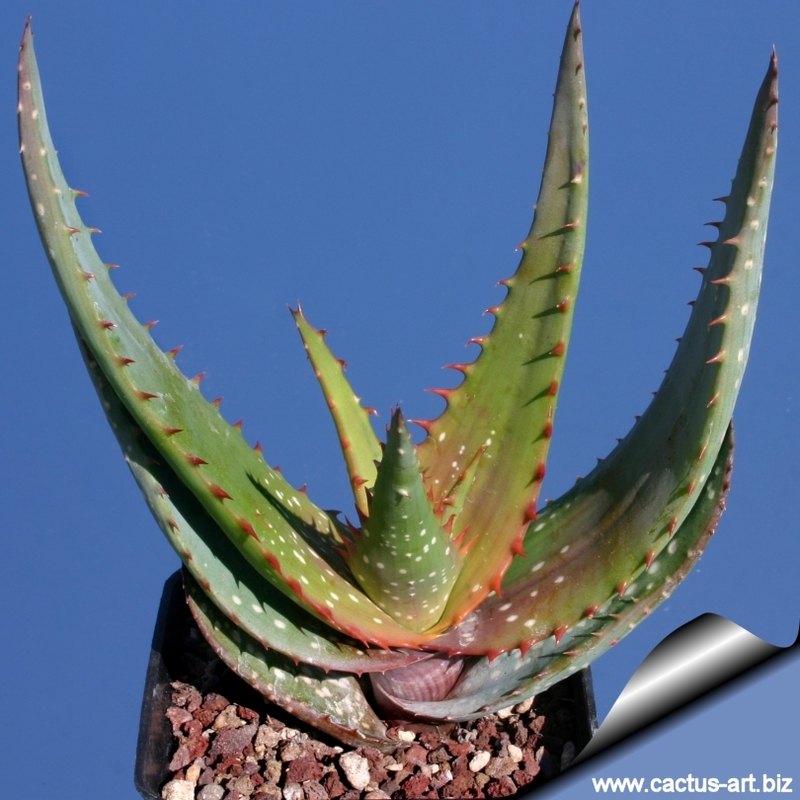 Each season has a distinct attractiveness it is a very beautiful aloe! Description: Aloe microstigma is a medium size and very attractive aloe that usually occur singularly or in small groups, up to 50 cm in diameter and 60-70 cm tall. Stem: Young plants are stemless, while the older ones develop a short decumbent stem up to 50 cm tall and 10 cm wide, which is usually covered with remains of old leaves . 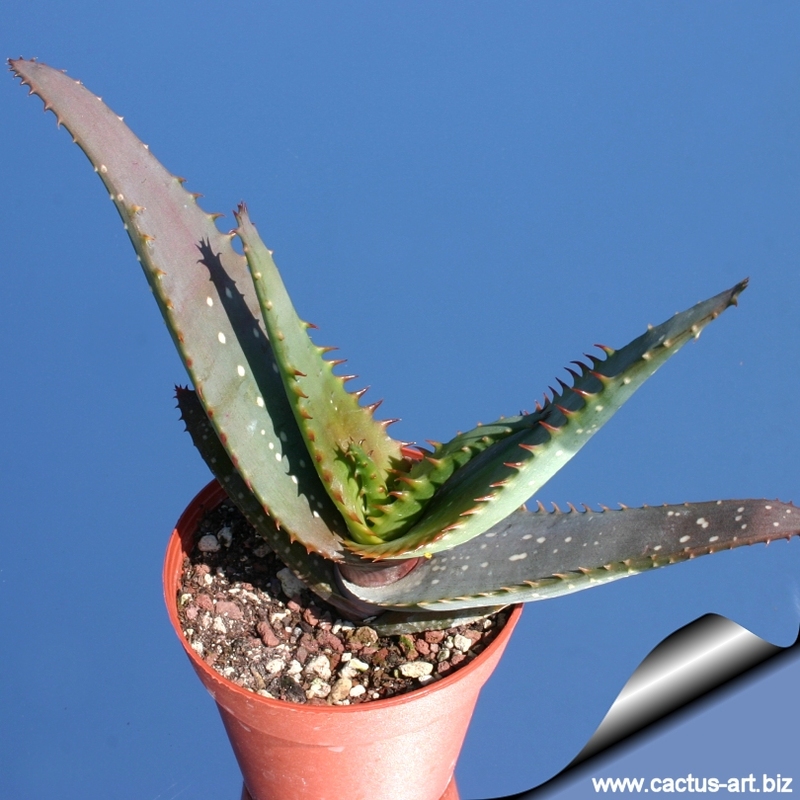 Leaves: Up to 40 cm long and 7.5 cm wide, lanceolated to deltoid arranged in spiralled rosettes (, but in juvenile plants they are ranked in vertical rows). Conspicuously scattered with white spots on the upper and lower surface, which contrast well with the reddish-brown teeth along the margins. Teeth non pungent 2-4 mm long, 5-10 mm apart. The leaves start out horizontal along the ground and suddenly turn up to the sky so that the tip is vertical. 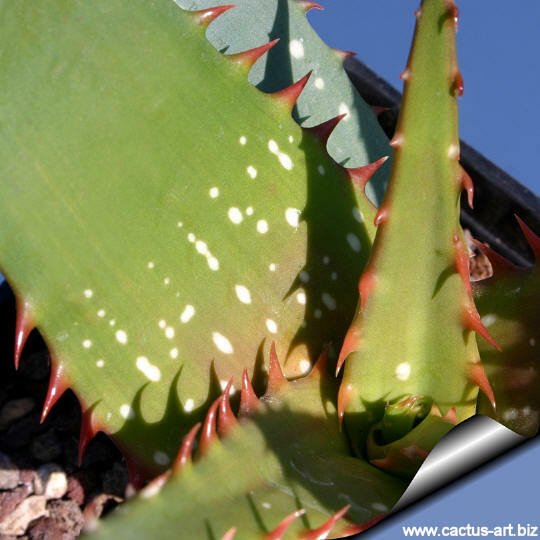 Mature leaves are a solid brownish green, the young growing leaves are tender light green and have many fine white dots, but in full sun, may get yellowy and sunburned. In shade has a more turquoise colouration. In winter, leaves can become incredibly colourful showing pinks, purples, yellows and greens and in general turn reddish brown if suffering from environmental stress. Flowers: This species shows a variety of flower colours ranging from yellow to red with all the colour possibilities in between. They typically are red until they are open, and then turn pure yellow. In some plant, however, the buds and open flowers may be uniformly red or yellow. The robust simple raceme (stem on which all flowers are borne) are conical to cylindrical-accumulative 90-100 cm long, coming out (usually) 1-3 at a time. Blooming season: Flowers profusely from late autumn until January. Seeds: Small, black to 2 mm in diameter, inconspicuously winged and wind dispersed. A. microstigma means 'very small spot' and conspicuous white spots appear on the leaves, which contrast well with the reddish teeth along the margins. Aloe microstigma is one of the most floriferous aloes in South Africa with a wonderfull towering inflorescence that resembles flaming torches. Habitat: it can be found in a variety of dry habitats comprising flat open areas, steep rocky slopes, or amongst bushes. Where they grow, they are near to invisible between rocks and dry bushes. Ecology: Aloe microstigma is pollinated primarily by sugar birds particularly the lesser double collard sugar bird which extracts the nectar produced by the flowers. Insects may also be responsible for pollination. Seeds are produced in abundance and this serves as a survival mechanism. Seeds are parasitized by small day flies that lay their eggs in the seeds, their larvae then live off the seeds. The success of germination is relatively high giving rise to the abundance of the species. The rosette of leaves helps to cool the plant in that the upper leaves provides shading for the lower ones. Another interesting adaptation is the inward folding of leaves during the hot summer months. This helps to protect the softer and younger leaves from extreme temperatures. Leaves unfold again in cool weather. Cultivation: Easy to grow, requiring very little care. It can be grown in large containers. Always use a good quality, loamy sandy soil with plenty of drainage chips at the bottom of containers. It tolerates weekly watering in the summer; once a month, or not at all in the colder months of December and January. 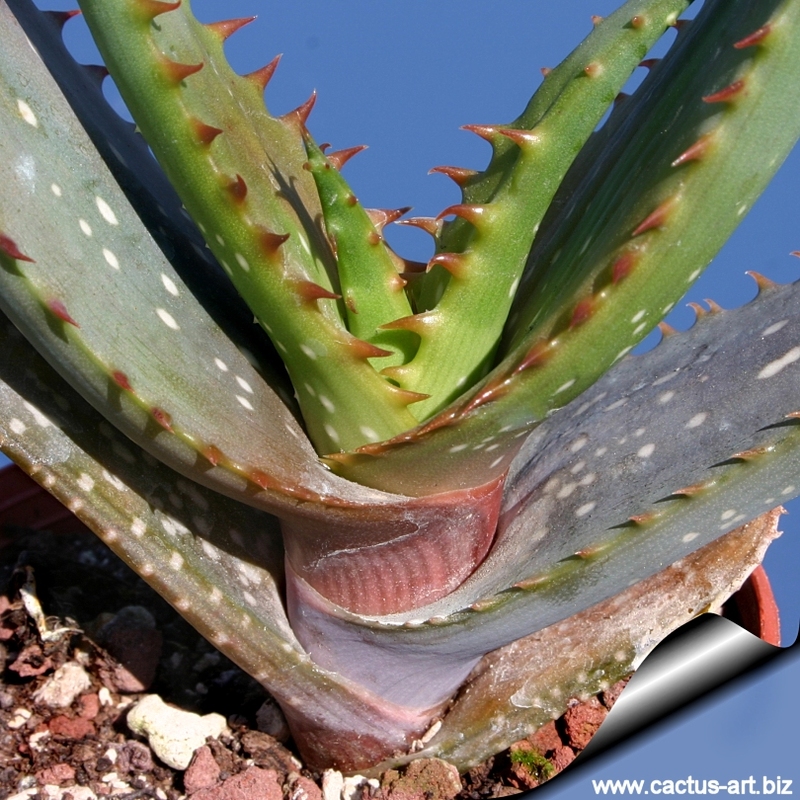 Can withstand long periods of drought, but they will thrive and flower more profusely if watered in the correct season. 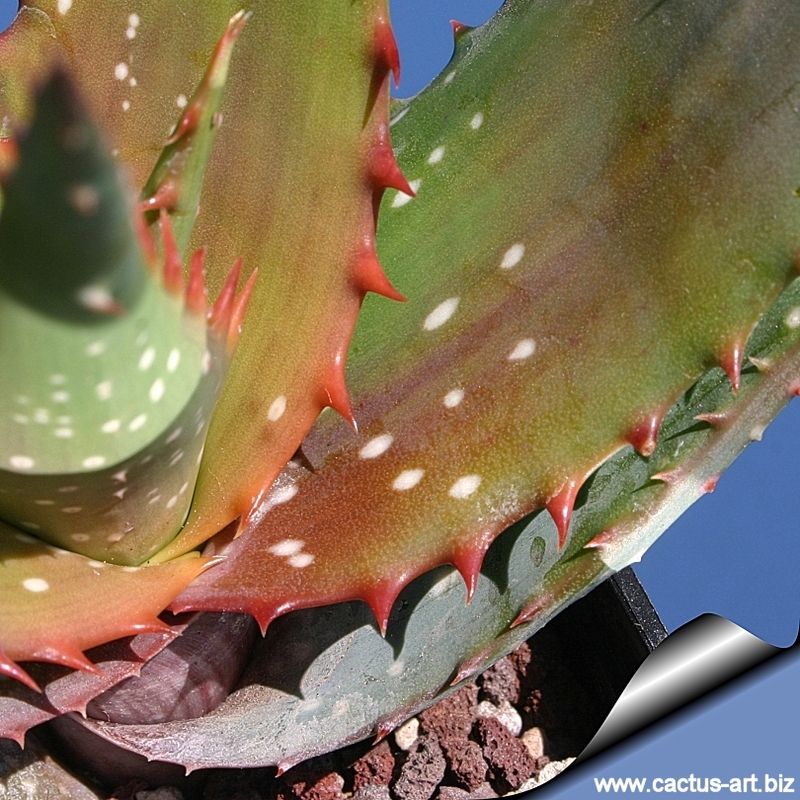 Incorrect watering, poor drainage or too much shade can lead to attack by pests and diseases. They can take a few degrees of frost in winter as well, but prefer hot summers. It grows much better outdoors in spring and summer. In mild climates it can be cultivated outdoors for use in landscaping, preferably planting it in hot and dry rock gardens. They will grow best in regions with a climate close to that of their native deserts not too cold, and not too wet. They grow slowly, but not agonisingly so being able to increase their height by 10- 30 (or more) cm per year under favourable conditions. Propagation: Almost exclusively by seeds planted in autumn, in trays of coarse river sand. 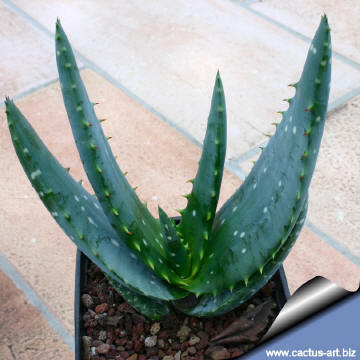 Gardening: This aloe can be grown in large, rocky, well-drained soil in gardens in drier areas. It is very drought resistant but susceptible to frost. They make particularly nice low maintenance garden plants which are especially attractive when in flower in the barren winter months. 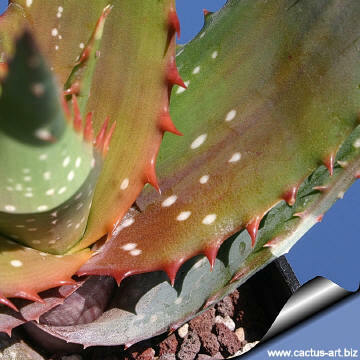 Medicine: Aloe microstigma is not recorded as a medicinal plant but it is said that the bitter sap has healing properties in cases of cuts and burn wounds.